Choosing to add recessed lighting adds value and a new dynamic to the interior design of a room. The results are stunning and the possibilities are limitless. 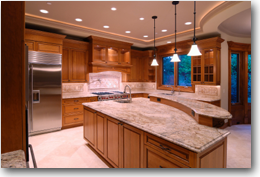 You may be surprised to find out how quickly and inexpensively we are able to install your selected fixtures. Our flexible schedule will provide a way do a complete install at your convenience. You can rest assure that we will leave the premises clean with absolutely no damage to the existing drywall. Consult PDX Electric to find out about your options for interior lighting.